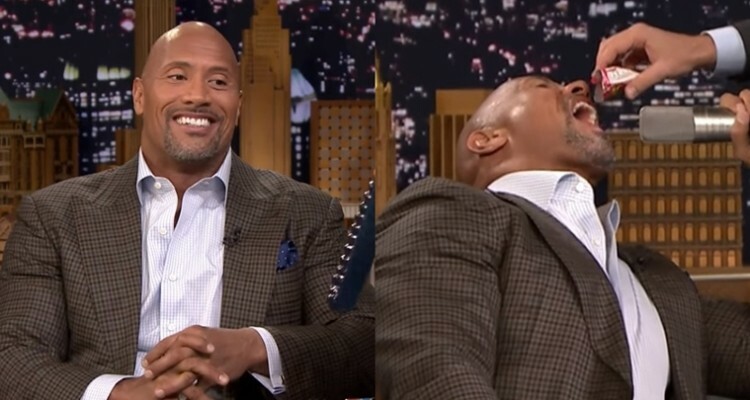 Dwayne Johnson was a guest on The Tonight Show, when anchor Jimmy Fallon convinced him to try some candy for the first time in almost three decades. Actor Dwayne ‘The Rock’ Johnson ate his first candy in 27 years on the sets of The Tonight Show, an American TV talk show on June 17. The show’s host Jimmy Fallon convinced him to eat a pack of Pop Rocks, after Johnson admitted that he had not eaten any sweets since 1989. The wrestler-actor said that he’s not really a candy guy, and the last time he remembered having candy — Twizzlers to be exact — was when he went to watch a movie, 27 years ago! In order to convince Johnson to end his long spell of candy-avoidnace, Fallon offered a whole host of sweets — from Ring Pops to a huge Gummy Worm — as temptation. Though he initially gravitated towards the Twizzlers, Fallon offered to pour in some Pop Rocks straight into his mouth, just for kicks.